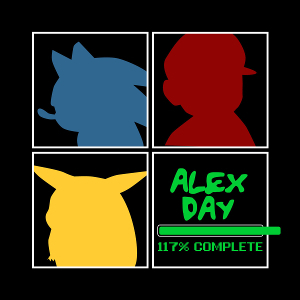 117% Complete is an EP about video games from UK singer-songwriter Alex Day. For those who don’t know about Alex, he is a musician and video blogger who has risen to fame through his YouTube channel “nerimon”. He pretty much invented the Trock (Time Lord rock, or rock music about Doctor Who) movement with his band Chameleon Circuit, and has also been involved with many other music groups (such as Sons of Admirals) and video blogging activities (such as Chartjackers). His YouTube channel is one of the most subscribed in the UK. His EP, 117% Complete is an entertaining, if a bit pessimistic, mini album. The three songs are about his recent experiences with Mario Kart Wii, recent Sonic the Hedgehog games, and current Pokémon titles which people who have played the games can relate too. The songs feature an excellent use of 8-bit sounds, well written lyrics, and good integration of original themes. Alex has a great singing voice too. The EP opens with “Sonic Doesn’t Need a Story”, probably my favourite song from the EP. Anyone who has played recent Sonic games or read about them knows exactly what Alex is talking about, and he captures peoples feelings towards recent Sonic games really well in this song. I really like the 8-bit work here too; it’s a suitably energetic song, with drum rhythms that sound like Phil Collins. Next up is “I Hate Mario Kart Wii” which takes on a more sombre approach. Alex this time opts for a piano and strings accompaniment, with electronic drums. Again, anyone who’s played Mario Kart Wii knows the feeling when it comes to the lyrics and, although I still like the game, it’s hard not to relate to the lyrics if you’ve it, and even if you haven’t it’ll still make you laugh. This song probably has the funniest lines in the EP. Last but not least is “Pokémon, What Happened to You?” A song which is a half 8-bit, half rock. This is probably the weakest song of the three in my opinion — it’s the least interesting in the accompaniment and the lyrics seem a bit too fanboyish. This being said it’s still a good track, and it’s got plenty of funny lines. Plus I still know a few people who are longing for the days of old when it comes to Pokemon, so they’ll have a lot to relate to here. Overall 117% Complete is a very entertaining, funny, and impressive EP, which is well worth checking out. You may not completely agree with everything Alex says in the songs, but overanalysing this album is not what it was made for. So just enjoy, and if you like Alex’s voice and style, then check out some of his other stuff as well. Alex, if you read this, make more of these songs — they’re great. Posted on August 1, 2012 by Joe Hammond. Last modified on January 18, 2016.